All modern metro systems include a tunnel ventilation system and a control system (the Ventilation Control System or VCS), to ensure that the required mode of ventilation can be easily selected by a railway traffic controller. 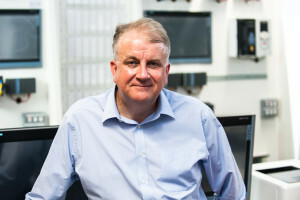 In this article, Simon Burras, Managing Director at Applied Industrial Systems (AIS), outlines the requirements and complexity of Crossrail’s tunnel ventilation control system, how it was tested and how the controllers who use the system are being trained. Why do we need tunnel ventilation? Moving trains create air pressure and ‘natural’ ventilation as they move through tunnels. If a train has to stop for any reason, forced ventilation is required and provided by a tunnel ventilation control system (TVCS). Necessary for safety and compliance purposes, a TVCS is designed to process a complex set of logic in order to set up the required ventilation modes for normal operations, maintenance and emergencies. Fire in the tunnel leading to a requirement to evacuate passengers and control smoke so that the escape route has a fresh air supply (i.e. smoke is extracted in one direction and passengers escape in the other). Given the variables – including train positions, the location of a fire and the availability of ventilation equipment – the control systems are required to process a complex set of logic and yet keep the user interface to the controller as simple as possible. The objective is to ensure that that during an emergency, there are no delays in activating the system – controller actions have to be simple and obvious. Testing such a critical and complex system is one of the most important aspects of the development. This is completed by a team of control system software engineers using a dedicated tunnel ventilation control system (TVCS) test suite which is run using simulation devices to mimic live operation of the plant. Every single operational mode that could feasibly be required once the system is fully installed needs to be tested. Built by AIS using Siemens’ technology, the simulated Crossrail test system is a complete replica of the fully functional tunnel ventilation control system. But unlike the live site, the action of the 48 fans, 160 dampers and over 500 actuators that control the airflow into and out of the 18 tunnel shafts along the metro line are being simulated using Siemens’ SIMBA PRO simulation devices. The objective is to ensure that the logic controlling each of the operational sequences can be fully tested, including the back-up modes used if one or more ventilation shafts become unavailable. In fact, testing the failure and back-up modes takes a significant proportion of the project’s time as there are thousands of permutations of possible field equipment failures. The system is developed to be fault tolerant and testing has to prove this as part of the overall validation and verification activities to meet the SIL2 safety requirement in accordance with EN 61508. Installing Siemens’ SIMBA Pro simulation hardware is a crucial part of the test system design as the equipment enables the test team to write scripts that simulate all of the different Input and Output responses. For example, when the system turns on a fan, the simulation recognises the command and is able to provide feedback that is required as part of the operational logic. Similarly, faults can be simulated (eg a damper failure) to test back-up modes. Although it is technically possible to test the software without simulation, it would take longer and be less accurate because each scenario would have to be manually simulated using switches and lamps. The philosophy adopted for Crossrail testing has one simple aim – that by the time the system arrives on site for commissioning, no logic changes or software changes will be required. Using the simulation approach described, we are as near to 100% confident of achieving this aim as it is possible to be. Crossrail’s tunnel ventilation control system has automatic and manual modes, that require an operator to initiate the appropriate ventilation mode. Since the majority of manual interventions involve emergency situations, training railway controllers to use the system competently is an important and on-going requirement. In an emergency situation, controllers must decide how to apply tunnel ventilation within seconds and, from experience, one of the best ways to achieve this is by involving controllers in the design process from an early stage. Rail for London (the operators of the new Elizabeth line being built by Crossrail) were keen to engage operators in the design of the operational screens for the TVCS (known as the Human Machine Interface or HMI) early on in the project. Designing the user interface with the information for the operator to make a fast and correct decision is key. One effective strategy is to develop HMI control screens according to a phased approach using the ‘teach back’ method. This allows controllers to influence the design and development phase at each stage, giving them the opportunity to request amends and enhancements before changes become costly. Once controllers have given their input, the next version of the prototype is developed and literally ‘taught back’ to the controllers. This technique is based on the fact that people are typically better at pinpointing what’s missing than specifying exactly what they want. As an iterative process, it also means that controllers become embedded within the design process and have greater ownership of the final delivered system. For instance, when developing the HMI screens for Crossrail, it became apparent that in areas where the metro lines split to take passengers north east or east, the initial design of the screens was overly complex for use in the event of an emergency. Working further with the controllers, the HMI was simplified to make the response simpler and therefore more effective. Early training before deployment of the full system is another vital aspect of the implementation phase that TfL wanted to achieve. Traditionally, control systems training has been performed using static prototyped interfaces or with a comparable system, to teach the operational principles. For instance, providing training on another equivalent metro system in a different city. Whilst this gives controllers general experience of how the system works, it can never be as accurate as receiving training based on ‘real life’ actual scenarios. Working with TfL, Applied Industrial Systems has taken the prototype user interfaces at different stages and provided operators with a hands-on training simulator early in the project life cycle. This simulator has two user interfaces – for trainers and trainees. The trainer can create live operating scenarios with the trainee’s screen displaying information as it would for the live railway. The trainer can then introduce emergency scenarios – such as a train fire – for the controller to respond to. The system monitors the controller’s response and reports on whether it was correct or not, which is used to provide further scenarios. Ultimately, the ventilation training simulator is a key component of maintaining the safe operation of the Elizabeth Line and maintaining the SIL2 rating of the tunnel ventilation control system. Overall, simulation makes training more relevant and also means that training sessions can easily be repeated. Controllers can maintain their skills and remain capable and more confident about applying the tunnel ventilation control system, should an emergency occur. Alcohol and drugs – time for the industry to adopt official legislation?